Sidman's lyrical poetry and Krommes' charming illustrations illuminate this intriguing shape found all throughout the universe. 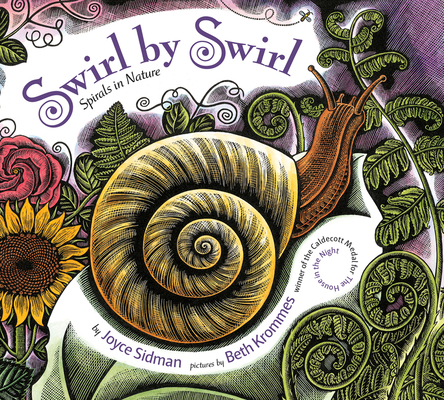 Young readers will enjoy discovering all of the different spirals in nature in this new board book edition. What makes the tiny snail shell so beautiful? Why does that shape occur in nature over and over again—in rushing rivers, in a flower bud, even inside your ear? With simplicity and grace, Sidman and Krommes not only reveal the many spirals in nature—from fiddleheads to elephant tusks, from crashing waves to spiraling galaxies—but also celebrate the beauty and usefulness of this fascinating shape. Beth Krommes is the Caldecott Winning illustrator of The House in the Night and other beautifully illustrated, much-acclaimed picture books like Swirl by Swirl, and Butterfly Eyes and Other Secrets of the Meadow. She lives in Peterborough, NH. Visit her online at www.bethkrommes.com.